What does a substitute teacher, a time-traveling horse and a history lesson have in common? 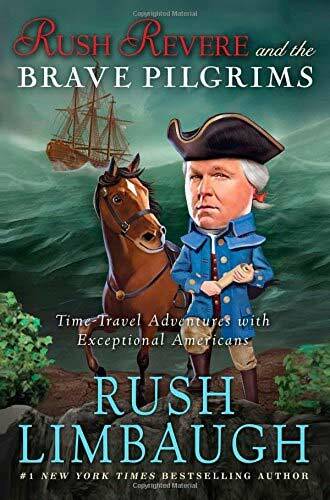 They are all seamlessly combined in the new book Rush Revere and the Brave Pilgrims: Time-Travel Adventures with Exceptional Americans. Written for younger readers, this book gives a look at the past through the adventures of a substitute history teacher, his horse Liberty, and his students. In order to spice up his lessons, history teacher Rush Revere travels in back in time to experience moments in history for himself. In this book, the first of three released titles, Rush takes two of his students back in time to learn about the Pilgrims. Through several jumps they learn why the Pilgrims are looking for a new home, what happens during their trip along the way and the events that unfolded after they settled in the New World. Every page in the book is printed in full color, including several pictures of the characters themselves, diagrams of the ship, maps, and portraits of other famous figures that play a part in the story. These additions help bring the story to life and be a lighthearted read. The purpose of the book is to make learning about history fun for the average young reader. Those expecting major controversial issues presented in the book will be disappointed. This is a fun story intended to teach children about the Pilgrims and the American Dream. While some of the dialog lags a bit and includes a fair amount of slang, it appeals to the demographic for which it is written. Children 8-12 will enjoy this easy-to-read historical fiction. "Liberty again whispered to me, 'William really put you on the spot with that question. I couldn't have dug you out of that one. Nice job answering him! Maybe you should get your own radio talk show. You know, callers call in with questions and you give them advice and stuff. I'd totally call you!' "
Rush Limbaugh is host of The Rush Limbaugh Show—the nation’s highest-rated talk radio program, with an audience of more than 20 million—and the #1 New York Times bestselling author of Rush Revere and the Brave Pilgrims as well as other various books and publications. He and his wife Kathryn live in Palm Beach, Florida.